Washington state voters approved new gun regulations in I-1639. Here’s what the law will do. Washington voters this week approved Initiative 1639, a sweeping package of new gun regulations. It passed with more than 60 percent of the vote. Here's a look at what the initiative will do. 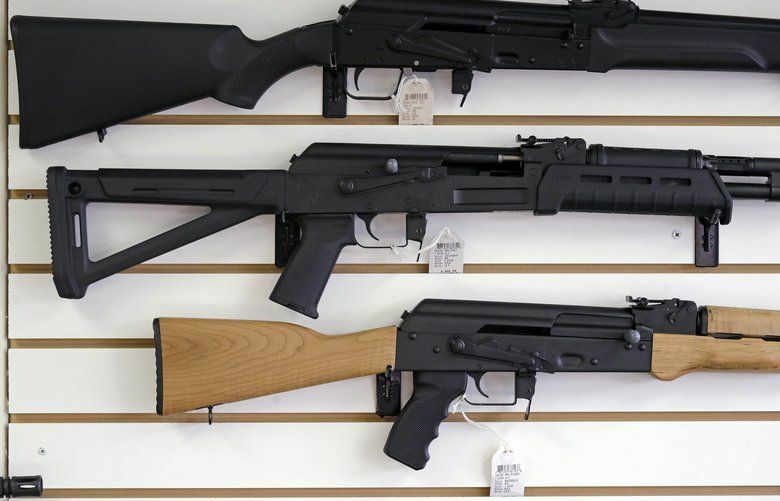 OLYMPIA — Washington voters approved a sweeping package of gun regulations Tuesday, the latest in a handful of firearms-related initiatives in recent years. Initiative 1639 passed with more than 60 percent of the vote. Opponents say they will sue in an attempt to block the law. Here’s a quick recap of the initiative. Q: What does the initiative do? A: I-1639 raises the legal age to buy any semi-automatic rifle to 21, from 18. People wanting one also have to pass an enhanced background check, show proof that they have taken a firearms-training course, and wait 10 business days before they take possession of the weapon. And the initiative directs the state to begin developing a process to check at least annually to make sure owners of handguns and semi-automatic rifles are still legally eligible to possess them. Q: What about the “safe storage” provision? Q. When does the law go into effect? A. The initiative says the provision that raises the minimum age to legally purchase a semi-automatic rifles to 21 will take effect Jan. 1. The rest of the provisions go into effect July 1. Q. Who was behind this initiative? A. This was the third in a series of ballot measures brought by the Alliance for Gun Responsibility in recent years in response to the mass shootings that have occurred nationwide, as well as other, less publicized firearms-related deaths and injuries. I-1639’s citizen sponsor was Paul Kramer, the father of a teenager injured in a 2016 Mukilteo house-party shooting that left three others dead. The shooter in that instance was a 19-year-old who bought an AR-15 rifle about a week before the attack. The “yes” campaign raised nearly $5.5 million, with much of that coming from a handful of big-dollar donors, like venture capitalist Nick Hanauer, former Microsoft CEO Steve Ballmer and Microsoft co-founder and philanthropist Paul Allen, who died last month. Supporters of the initiative included two of King County’s top law-enforcement officials, Prosecutor Dan Satterberg and Sheriff Mitzi Johanknecht, as well as state Attorney General Bob Ferguson. Q. Who were the opponents? A. The largest opposition groups were the National Rifle Association and a pair of Bellevue-based gun-rights organizations, the Second Amendment Foundation and Citizens Committee for the Right to Keep and Bear Arms. Those groups raised roughly $610,000 in cash and in-kind donations to fight the measure, campaign-finance records show. Several Washington law-enforcement groups or their members also opposed the initiative. Q: What were the opponents’ arguments? A: Gun-rights supporters called I-1639 poorly written and likely ineffective. They also argued it would criminalize self defense by allowing charges against a gun owner whose firearm unintentionally falls into the wrong hands. Some law-enforcement groups contended I-1639 could be unconstitutional and does nothing to address gun violence related to mental health or substance abuse. Others objected that the initiative doesn’t exempt police officers from its provisions. Some members of the Washington state Fraternal Order of Police said the initiative would stigmatize the semi-automatic rifles used by officers, since the initiative language refers to them as “assault” rifles, said Lynnette Buffington, executive director of the group. Gun-rights supporters also contended the initiative’s petition sheets were unlawfully formatted, because they did not show exactly how the measure would change existing state law. Alan Gottlieb of the Second Amendment Foundation and Citizens Committee for the Right to Keep and Bear Arms said Tuesday night, after the initiative passed, that it would be challenged in court. Gottlieb declined to explain the grounds for any challenge.